Saturday saw Baylor continue to run and pass up and down the field in their throttling of West Virginia 62-38 and Oklahoma played almost a perfect game as an injury ravaged and helpless Kansas State was kicked like a dead dog 55-0 in Manhattan. Texas Tech had a much closer than expected 30-20 win against Kansas and TCU‘s offensive firepower was too much for the Iowa State Cyclones in Ames, 45-21. Baylor is the best team in the nation right now. That is my call as they have a tremendous offense, one that can run the ball and pass the ball with excellence. Seth Russell is the key and his running is just as potent as his passing game (with the best set of receivers in the country). The Bears can be beaten as I have mentioned in previous articles, but it will take a defense that is better than average and the BU will need to cooperate with some turnovers. Currently, only Okla. State and Oklahoma has a chance but with the Sooners going to Waco, it will be a long shot for an upset there. As for Baylor’s trip to Stillwater, what I have said must happen with the turnovers, and the Pokes themselves would have to limit mistakes by their offense That is a tall order. Baylor is not perfect on defense and they do give up points and yards, but for them to lose a game in conference, I won’t put any money on it. As for TCU’s chances of beating Baylor, that’s iffy. The game is in Fort Worth and that is a positive for TCU. The Frogs defense gave up over 400 yards to Iowa State and Baylor will shred the Toad’s defense. That Frog defense has to get better. For fans of the Purple in Fort Worth, I’d be worried. Right now, it is not good in any way for TCU in that match up. The worst thing in the world is having to outscore Baylor. The second worst thing is having to outscore TCU. This could be the game of the year in this part of the country if both continue to win out. All in all, Baylor is the class of the Big 12, because they play better defense than the Frogs. Things can change if the injury bug hits as it can, especially if one on the top quarterbacks in the league goes down. The Oklahoma Sooners came to play yesterday and Baker Mayfield tossed 5 first half touchdowns as it was no contest from the start. Kansas State was pitiful and needs to regroup. I wouldn’t want to play them next. Texas Christian might be the 2nd best offensive in the conference and Iowa State was a step slow and a few pounds light in trying to stop Trevone Boykin and his crew. The Frogs, as said above, have to improve their defense. 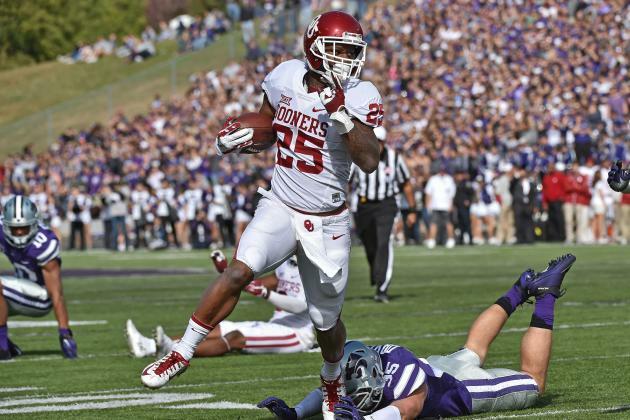 Trips to OU and OSU will be tough ones to win. Both the Pokes and Sooners have better defenses. Can TCU outscore them? Maybe. 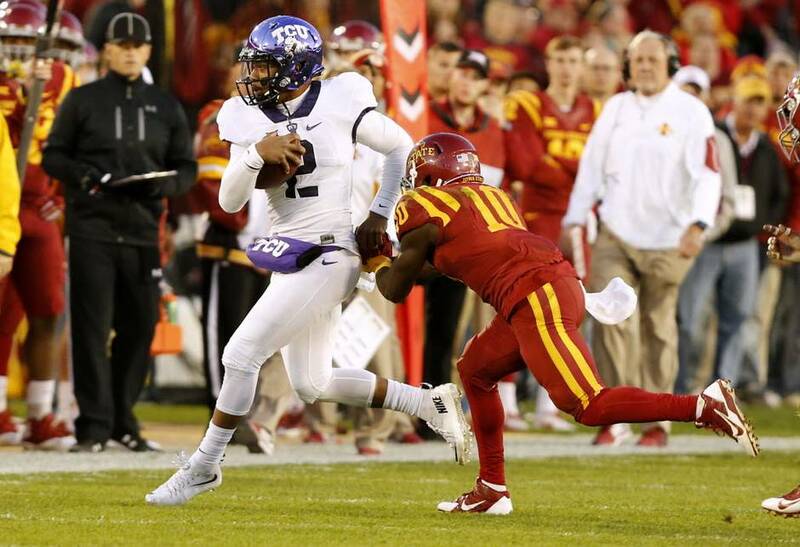 That TCU passing attack is an A+ with quite possibility the best player in the country in Boykin in command. Kansas played a competitive conference game with the Red Raiders and showed some improvement. Lack of effort also showed that Texas Tech, at 5-2, must play better in Norman next week or they will get their behinds spanked by the Sooners. I lost some good feeling toward Tech in Lawrence. 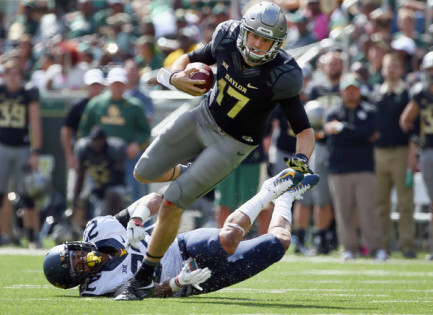 Seth Russell #17 of the Baylor Bears carries the ball against Jarrod Harper #22 of the West Virginia Mountaineers in the third quarter at McLane Stadium on October 17, 2015 in Waco, Texas.